In a recent article we explored the increasingly dynamic factors that influence the seasonal spreads of European gas hub prices. Although there are a range of sources of seasonal flexibility in Europe, storage is the most reliable given that flexibility from alternative sources is conditional on relative market pricing (e.g. LNG). But how does this impact the outlook for gas storage investment in Europe? On the one hand, storage faces increasing competition from other sources of flexibility. On the other hand, demand for gas storage is likely to rise with European import dependence, increasing commodity price volatility and concerns over security of supply. But market price signals are required to incentivise storage project investors to take on the substantial capital expenditure involved. Despite a recent recovery in seasonal spreads, current market conditions present a challenging environment for storage project developers and operators. A useful starting point when trying to understand the challenges storage projects face is to look at project economics. This is helpful because it provides an insight into the key characteristics that drive storage project value. It also highlights the differences in characteristics that make each storage project unique. In the diagram below we have constructed a simple summary of the project economics for a hypothetical storage facility based on the conversion of a depleted field in the UK continental shelf. The assumptions are not based on a specific development project or existing facility but on a broad assessment of assets such as Rough storage and publicly available information on proposed conversions (many of which have since been cancelled or put on hold, as highlighted by the recent announced cancellation of Centrica’s Caythorpe project). At the simplest level storage facilities generate value by injecting gas during periods of low demand and price, and withdrawing during periods of market tightness and high prices. Revenues are commonly categorised into intrinsic and extrinsic, although care is needed when using these terms as the precise definitions are often misused for the sake of generalisation. Intrinsic is loosely used to describe the margin that can be obtained from structural seasonal price spreads, where as extrinsic covers the value that can be extracted from the assets flexibility in response to changes in market prices. The driver of intrinsic value is the spread between summer and winter prices. In the example above, we have estimated the seasonal spread required to incentivise investment as 16 p/th (a proxy for the Long Run Marginal Cost of seasonal spreads). 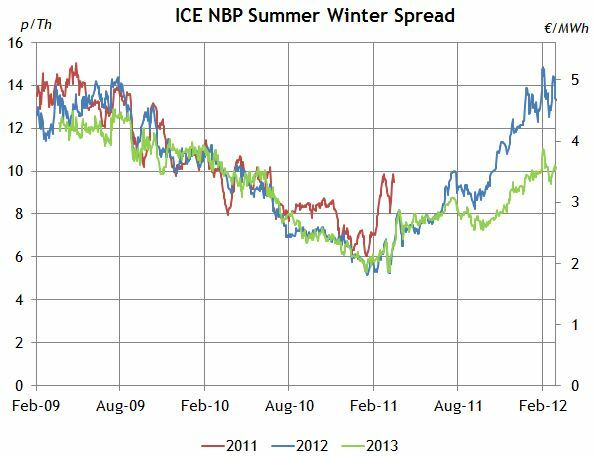 Despite the recent upturn in seasonal spreads the 16p/th breakeven value highlights the current challenges facing project developers in justifying their investments (a chart showing the last 3 years of NBP seasonal spreads can be found here). In addition to intrinsic value, storage flexibility generates extrinsic value as owners optimise the use of their capacity in response to changing market conditions and prices. The level of extrinsic value is a complex function of the seasonal spread, spot price volatility, forward spread volatility and asset flexibility. But extrinsic value also depends on the interaction between these market dynamics and the hedging and asset optimisation strategies employed by the asset operator and trader. There is a range of hedging/optimisation strategies designed to monetise extrinsic value, with the key trade off being the expected gross margin and level of uncertainty around it. More complex strategies require asset management models to generate forward delta exposures to inform hedge positions. Calculating these deltas, and extrinsic value more generally, is not straight forward given the time dependent optionality of storage capacity and the complex spot and forward price processes. However, there are a variety of well established techniques commonly used. Key market dynamics such as product granularity, liquidity and transactions costs also influence the calculation and hedging of extrinsic value and need to be appropriately considered in any modelling activity. There is also a variety of available market information that can be used to benchmark model results. The split between intrinsic and extrinsic value varies across different types of storage. Rules of thumb are difficult given the broad range of factors that influence both. However, the extrinsic value for a typical seasonal storage facility accounts for 10 to 20% of total value, while for a fast cycle salt cavern facility it is likely to be closer to 50% of value. The level of extrinsic value is inversely related to intrinsic value, consistent with the relationship between moneyness and the value of a simple option. A wide spread implies that the storage option is in the money (i.e. high intrinsic value) and there is a lower likelihood that movements in the spread will create conditions allowing profitable readjustments (i.e. lower extrinsic value). If there is no seasonal spread the storage option is at the money (i.e. no intrinsic value) and any movements creating a positive spread would create value (i.e. higher extrinsic value). If the capacity of a storage facility is sold to third parties rather than used by the asset owner it may be possible to extract additional revenues through offering products that in combination are greater than the physical capabilities of the facility. This is possible as not all companies will optimise their use of capacity in the same way. Examples of this include selling unused incremental space, injectability or deliverability in the short term or offering interruptible services. The Centrica Storage product offering is a good example of this concept in practice. For many commercial decision makers the key issue is “value bankability”, in other words the level of certainty as to the different sources of storage revenue. It is natural instinct to place more weight on intrinsic revenues which are easier to understand and, within the forward market horizon, easier to hedge. But this can lead to a false sense of security as spread value is not so easily monetised beyond the liquid forward curve horizon. Extrinsic value may also be difficult to monetise, but spread volatility provides a consistent source of revenue that increases in importance if seasonal spreads are weak. The two key cost elements are the substantial project capital expenditure and cost of base cushion gas (or permanent inventory) required to maintain adequate pressure and deliverability. Both of these can vary greatly across projects. From a capex perspective the key differentiator is the type of facility under development, but cost is broadly proportional to storage capacity. Location and reservoir characteristics are key differentiators in the overall level of capital costs. As an example, the TAQA Bergermeer storage project has a significantly lower overall capital cost than the level assumed in our example above, partly due to its onshore location. Decisions around the compression kit configuration will have a key influence on overall cost. It is possible to increase the technical capabilities (specifically levels of injectability and deliverability) of the facility through increased investment. These attributes essentially define the overall flexibility of the facility which plays a significant role in determining the achievable extrinsic value. Therefore project developers need to consider the trade off between incremental value from increased levels of flexibility against additional cost. If cushion gas is ‘in situ’ in the form of un-produced gas in an existing reservoir, the cost of cushion gas is effectively the opportunity cost of delaying the production of the gas until the end of the life of the storage facility. Cushion gas costs typically have a larger impact on project economics if injection is required before the facility is operational, given the ‘up front’ spend. This will always be the case for salt cavern or aquifer facilities but can also be the case for depleted reservoir facilities such as Bergermeer (which entered a deal with Gazprom Export to supply the project’s cushion gas in exchange for gas storage capacity). Both scenarios are essentially swapping gas now for gas at the end of the life of the storage facility but in the first instance the developer already owns the gas. Like many energy infrastructure projects, investment in a gas storage facility requires substantial capital expenditure. Gas market spread dynamics and a complex margin structure create a challenging environment in which to commit to a project and this is compounded by current balance sheet constraints. Effectively valuing and monetising extrinsic value is likely to be a critical success factor across all stages of the project lifecycle. From a project developer’s perspective this means extrinsic value is correctly reflected in the project economics that underpin the investment decision. Owners of existing storage assets face the challenge of ensuring that extrinsic value is fairly reflected in capacity contracts. Finally, from the perspective of the asset operator (or capacity holder), capturing extrinsic value means effectively hedging and optimising asset flexibility.